John Marsh Snr, has over 30 years experience in stickmaking. He is totally self taught and his work is heavily influenced through his love of nature, the natural materials around him and the beautiful island where he has lived and worked since 1992. John gathers these natural materials all over Mull and surrounding areas using them whenever possible. Besides walking sticks, John makes crooks, cleeks, thumb sticks, ski poles, wading staffs, carved handles with animals, birds and fish, buffalo horn or ram's horn handles to name a few! John also fashions chandeliers, furniture, mirrors, lamps, coat hangers, fishing priests, whistles, necklaces, toggles and more all from naturally cast deer antlers. He also sells Red/ Roe/ Fallow/ Sika and Muntjac trophies mounted or on their own or matched pairs of the same. In fact anything with antlers in mind. The stickmaking components online business is now operated by son John who is based in Lancaster in Lancashire. For craftsmen who are creating their own walking sticks or craft projects, John has a stick making supplies shop. He has a wide range of components available which can be viewed and purchased online, please visit the Stick making Supplies Shop. 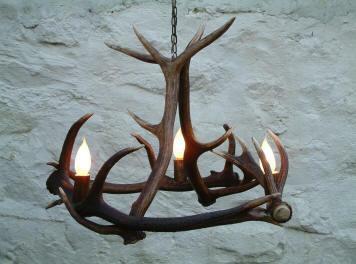 Visit www.antlerdesigns.co.uk to see the different chandeleirs and lighting that John snr produces, his other son Mick is also involved in this side of the business helping John create the unique chandeliers which are individually crafted mainly from naturally cast red deer antlers. Island Crafts John snr's shop on the Main Street in Tobermory where he is in partnership with his daughter Naomi who manages the day to day running of the shop which is open 7 days a week.